Young people are volunteering in record numbers, but many of them don’t vote. Why? 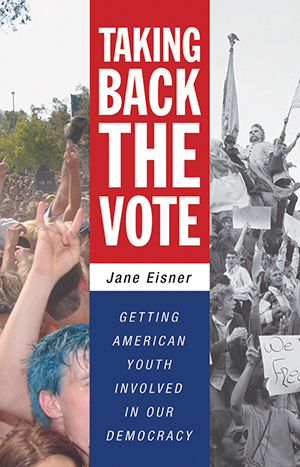 In Taking Back the Vote, respected journalist and political commentator Jane Eisner analyzes this decline in voter participation and suggests concrete ways of reinvigorating our youth to get out and vote. Eisner uses the historic 1972 legislation that gave eighteen-year-olds the right to vote as a starting point in her book, then she traces how and why young people have slowly stopped voting since that time. But Eisner asserts that this trend of declining voter and political participation can be reversed, and it is up to parents, teachers, coaches, and others to make that happen. Civic education, Eisner feels, is the key to bringing young people back into the voting booths. High schools in particular need to be offering civic education in the same way that they offer music, math, or sports education. Registering to vote needs to be easier. The act of voting needs to be more fully recognized by society-perhaps through something like a First Vote ritual, which would mark a young person’s coming of age as a voter. Filled with moving stories of kids becoming engaged as citizens as well as information for young people as they begin their civic involvement, Taking Back the Vote an inspiring resource for parents, teachers, community leaders, and all mentors who recognize the importance of empowering new voters.